Let me start by saying, this toy does not photograph well. 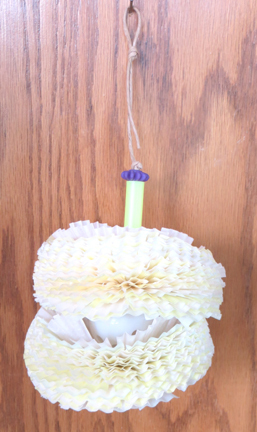 It is strung on paper rope, has a large gumball bead on the bottom along with a flower wheel, followed by about 30+ papers with a golf ball sized whiffle type fun ball in the center, then more crinkled papers and topped with another flower wheel, a straw stem and gear bead for added fun! Sized for the smaller to mid sized beaks in your house. There is lots of shredded fun waiting with the Belly Dancer! Our Goffin's cockatoo really enjoys shredding the layers of paper and then works on the "belly" (golf ball) of the toy.